“Dementia” is an umbrella term for cognitive disorders typically characterized by memory impairment, as well as difficulty in the domains of language, motor activity, object recognition, and disturbance of executive function – the ability to plan, organize, and abstract (1). Alzheimer’s Disease is the most common form of dementia and is the sixth leading cause of death in the United States, the fifth leading cause among persons age 65 and older (2), and costs our healthcare system $100 billion each year (3). Up to 5.3 million Americans currently have Alzheimer’s disease (4) and that is expected to double by 2050 due to the aging of the population (1). Every week, the subjects underwent a functional MRI during which they completed an hour-long protocol of cognitive tests used in previous research (6). Specifically, they completed a test called the n-back task (7) where they would be shown a letter for 1 second followed by a 2-second break. During the 1-back task, they were instructed to press a button if the letter on the screen was the same as that just shown. In the 2-back tasks, they had to press the button if the letter shown was the same as that presented 2 letters previously. The results were calculated with formulas used in previous research (8). At the end of 1 month, the researchers noted “a strong trend toward a significantly improved task performance” in the green tea extract group versus the control group. Specifically, those in the green tea group scored 13.7% higher in working memory compared to the control group (3.23 vs. 2.84, p = 0.066). What’s more, the functional MRI’s showed the green tea group had “a significant increase in communication” between 2 parts of the brain: the superior parietal lobe and the middle frontal gyrus, compared to the control group (p = 0.030), 2 regions known to house working memory (9). Surprisingly, the researchers did not separately show the results between the 2 green tea groups, instead grouping them together. So we do not know if 13.75 or 27.50 grams of green tea extract were responsible for the benefits seen. 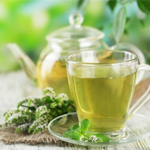 When suggesting how green tea may induce these improvements in working memory, the researchers pointed primarily to an antioxidant in green tea, EGCG, and its positive effect on a receptor in the brain called NMDA receptor. EGCG helps maintain the health of NMDA receptors in the presence of free radicals that damage cells and decrease overall function (10). The researchers also pointed to theanine, an amino acid in green tea that helps protect nerve cells (11). 2. Heron, MP; Hoyert, DL; Murphy, SL; Xu, JQ; Kochanek, KD;Tejada-Vera, B. “Deaths: Final data for 2006.” National Vital Statistics Reports Vol. 57, No. 14., Hyattsville, Md. : National Center for Health Statistics, 2009.